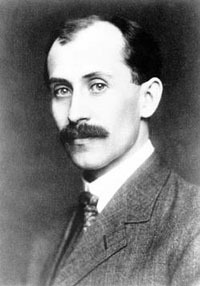 Invented the airplane with brother Wilbur Wright. The more mischievous, impulsive of the two brothers, but also the shyest. Made the first manned, powered, controlled heavier-than-air flight, in 1903. Served on the board of NACA (National Advisory Committee for Aeronautics) for twenty eight years. NASA was created from NACA in 1958. Wright State University is named after the brothers, and there is a Wright Brothers National Memorial in Manteo, North Carolina.